Cadets - Brighton technical school, Victoria, Australia. Australian Military Forces, Australian Cadet Corps, Certificate of Efficiency. This is to certify that Sgt. A. P. Hynes has completed 2 years efficient service with the Unit of Senior Cadets at Brighton Technical School. 13 November 1958. 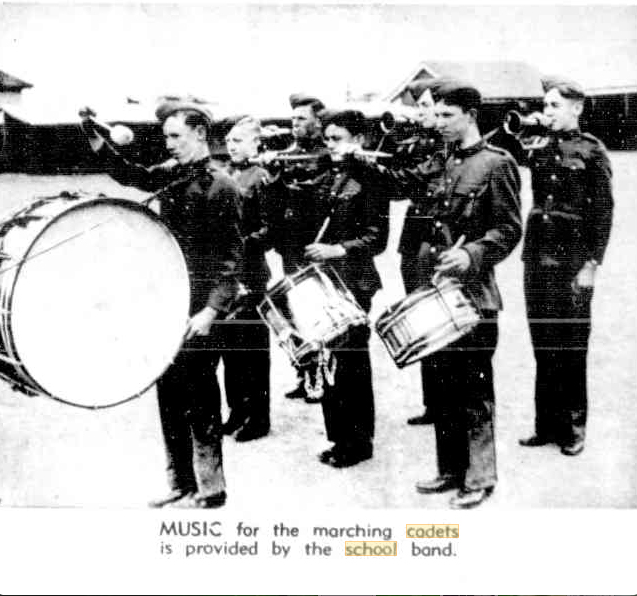 ​'The Cadet Corp in 1957 or 1958. All the cadets had to carry their rifles home to clean, (slung over their shoulder) while riding singly or in groups.' quotation by Tony Hynes. Tony Hynes is in the back row, second from the left. Tony Jewell is in the front row on the far left. Australian Military Forces, Australian Cadet Corps, Certificate of Efficiency, Cpl. B. Hynes has completed 2 years efficient service with the Brighton Technical School Cadet Unit. 9th November 1959. "The Age" Friday, 24 May, 1940. Page 15. ​Cadets of the Brighton Technical School, who formed the guard of honor at the Empire day celebrations parade at the school, are now a very efficient unit. Their smart uniforms and equipment, provided mainly through the generosity of the Brighton city council and other donors, as well as the efforts of the school council, evoked considerable praise from those who attended the service. This week the cadets, together with other cadets from Wesley College, have been practising tactical exercises and undergoing general training at Fawkner Park. "The Age" Wednesday, 6 December, 1939. Page 9. Despite the inclemency of the weather, there was a large gathering at the Brighton Technical School last night, when the newly formed cadet corps of the school paraded before the Governor (Sir Winston Dugan), who was accompanied by Captain Henry, A.D.C. The gathering included Mr. Macfarlan, M.L.A., the Director of Education, (Mr. J. 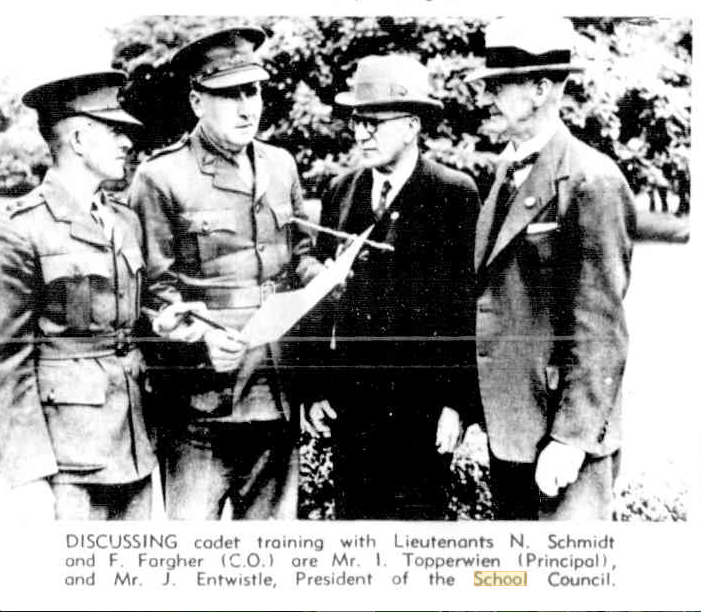 A. Seitz), the Chief Inspector of Technical Schools, (Mr. E. P. Eltham), the mayor, (Cr. Young), and members of the local council and their wives. The official party was received by Mr. R. Hayball, president of the school council. The sixty cadets, looking smart and trim in new uniforms, were inspected by his Excellency. As the Governor began to speak drizzling rain fell, and he expressed regret that it should spoil the ceremony. Referring to the present disturbed state of the world, he said the Empire had at its back splendid men and women, and particularly was that the case in Australia. (Applause). As an old soldier he was accustomed to standing in the rain - and in snow and other conditions - but he did not desire to keep his listeners out in the rain. Amidst laughter, as the rain ceased his Excellency said : "Now it has stopped. I propose to go on a little longer." (Applause). Addressing the cadets he said the youth of this country would be the men and women of the future, and on them would depend the safety of the Empire and the preservation of freedom, Christianity, and all that made up a good life. We wanted to support the weak and protect them from those who desire to overcome them. We belonged to a great Empire, which was grateful for the support it was getting from the Dominions. He congratulated Victoria on the part it was playing, and he could assure them that it was greatly appreciated by the mother country. (Applause). ​The official party was then escorted on a tour of the buildings, and inspected the annual exhibition of the students' work, which will be open to the public from 2 to 4 p.m., and from 7.30 to 9.30 p.m. to-day and to-morrow. C.Q.M.S. 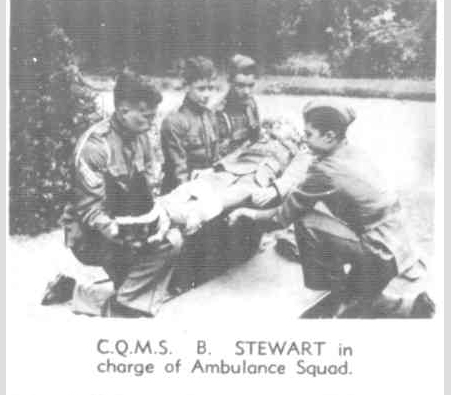 B. STEWART in charge of Ambulance Squad. "Australasian" Saturday 30 November, 1940. Page 33. SERGT. I. MATHEWS instructs cadets in correct use of rifles. "Australasian" Saturday 30 November, 1940. Page 33. RIFLE PRACTICE at the school. "Australasian" Saturday 30 November, 1940. Page 33. PICTURESQUE SETTING in Brighton Technical School grounds for its cadets on parade. "Australasian" 30 November, 1940. Page 33. MUSIC for the marching cadets is provided by the school band. "Australasian" Saturday 30 November, 1940. Page 33. 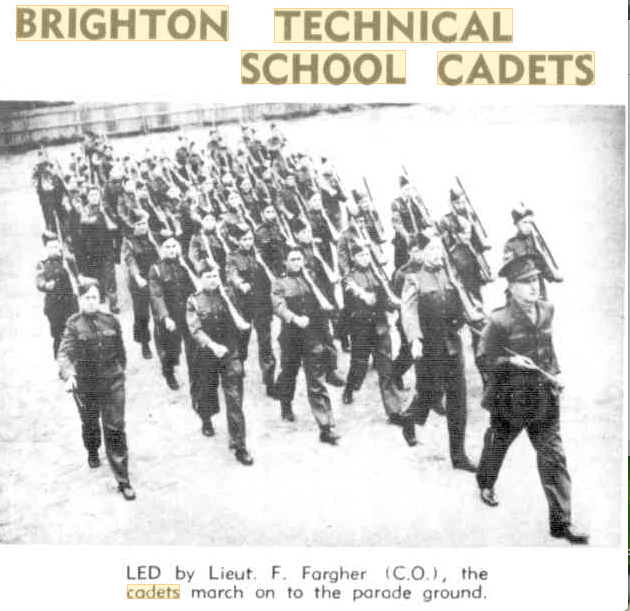 BRIGHTON TECHNICAL SCHOOL CADETS LED by Lieut. F. Fargher (C.O. ), the cadets march on to the parade ground. "Australasian" Saturday 30 November, 1940. Page 33. DISCUSSING cadet training with Lieutenants N. Schmidt and F. Fargher (C.O.) are Mr. I. Topperwien (Principal), and Mr. J. Entwistle, President of the School Council. "Australasian" Saturday 30 November, 1940. Page 33. 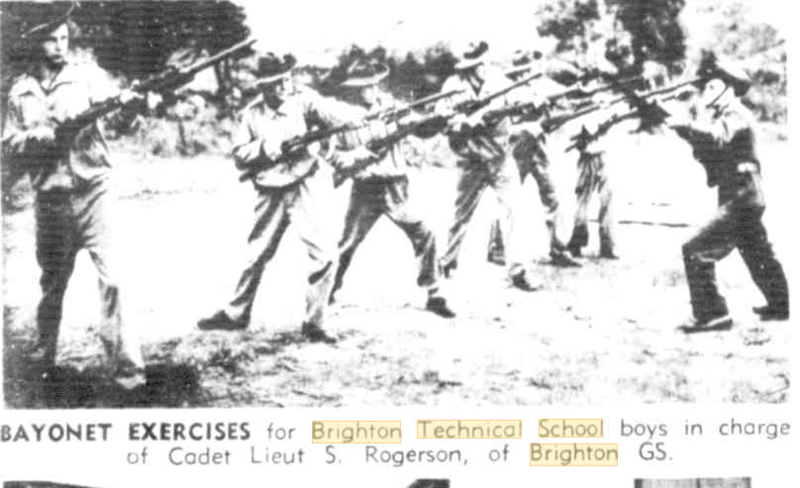 BAYONET EXERCISES for Brighton Technical School boys in charge of Cadet Lieut S. Rogerson, of Brighton GS. "Australasian" Saturday 12 September, 1942. Page 24.